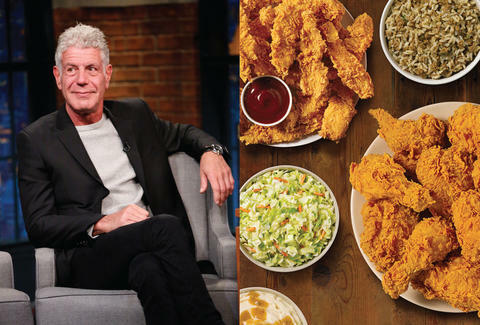 Anthony Bourdain might occupy the high perch of acclaimed TV host and globetrotting author, but the man is really all about the simple pleasures: namely, Popeyes Louisiana Kitchen. If given opportunity, the Parts Unknown host will gladly camp out at the gristly, fried chicken slinger and take most of his meals by way of hearty thighs and macaroni & cheese. In a new interview with People, the 61-year-old bon vivant said he thinks quite highly of the chain. When the magazine caught up with him, Bourdain had been eating every meal at a Popeyes in Lafayette, Louisiana -- the only outpost left in the country that still offers a buffet. His preferred meal for three days running? "Mac and cheese, spicy fried chicken, and biscuits and gravy with a fountain Dr. Pepper," per the magazine. For Bourdain adherents, this isn't exactly new information. The host has lauded Popeyes before, but was less than enthusiastic about publicizing his allegiance to the chain. Last year, though, he noted the fare was one of his shameless, guilty pleasures. "But my real guilty pleasure -- my really disgusting, shameful pleasure -- is the mac and cheese at Popeyes fried chicken," he said at the time. Elsewhere in the piece, Bourdain talks about his hectic travel schedule, and how he's able to assume at least some semblance of a normal life despite being on the road roughly 250 days a year. To compensate for his nomadic lifestyle, he never does two countries or cities back to back, so he can dedicate some time to his 11-year-old daughter, Ariane. For more, check out the full piece over on People.